Dubai: Global equities are expected to continue to maintain positive momentum. The Dow Jones Industrial Average posted solid gains on Friday amid signs of a thaw in trade talks between the United States and China. The Dow index rose 1.38 per cent to hit 24,706.35, gaining for the eight session out of the past 10 sessions. The S&P 500 index closed 1.32 per cent higher at 2,670.71. The index has gained more than 10 per cent in the past month. The index is now 8.9 per cent below its September 20, 2018, record close. “Looking at the current markets, it is pretty clear that equity markets have become immune to geo-politics. Traders are hoping the trade war won’t escalate any further and this what is stimulating the markets. The earnings reports are more positive. Overall in the coming weeks, we expect markets to be firm and moot question is whether the bottom is in place, we don’t know, that remains to be seen,” Naeem Aslam, chief market analyst with Think Markets, told Gulf News. The US stock market indices faced volatility in the last quarter of 2018, shaving off gains that it accumulated through the year and ended on a flat note. 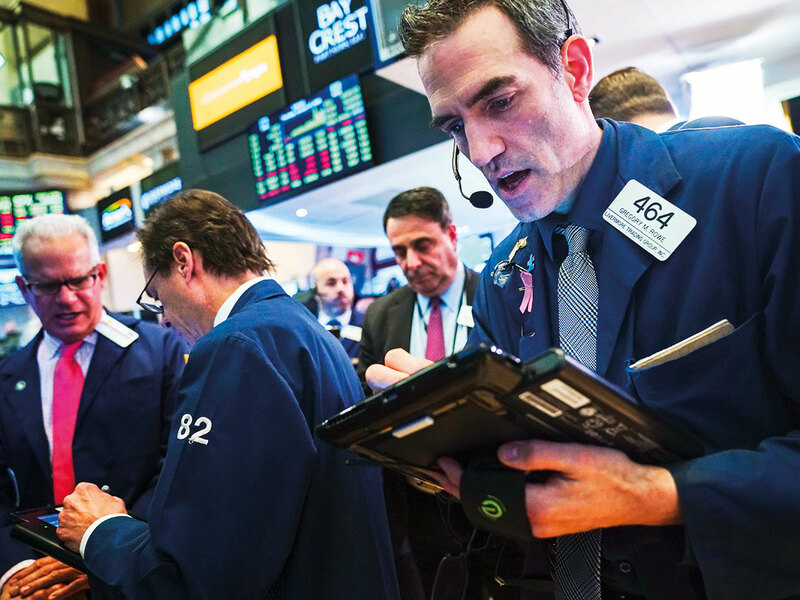 Traders are hoping that any ease in terms of trade tensions that erupted between the US and China could give them solace to turn their attention to risky assets. US president Donald Trump said positive progress had been made towards a trade deal with China ahead of the visit by Chinese Vice-Premier Liu He later in the month. Traders will continue to watch the developments on longest government shutdown in the US government and corporate earnings, which have been weighing on investor sentiment, but did not take into account any news on Brexit. “If the market activity of past week is any guide then it is fair to assume that Brexit developments no more remains a pivot point for global investors,” Aditya Pugalia — Director, Financial Markets Research at Emirates NBD said. Gold prices may extend gains to breach the elusive $1,300 (Dh4,774) an ounce mark. International gold prices closed 0.2 per cent higher at $1,281.56 an ounce, after having gained 1.2 per cent in the past month. Gold prices last traded at $1,300 an ounce in June last year. “Gold is looking bullish and it is likely that the yellow metal will move above the $1,300 mark as long as the support of $1,280 holds. The open interest for gold shows that investors are in favour of pushing the price higher given that they don’t feel comfortable with the ongoing geopolitical situation,” Aslam said.